Experience Hawaii in Santa Barbara Exquisitely remodeled 4 bedroom, 2.5 bathroom home plus an office in Monte Vista school district, tucked away on a quite street in a great San Roque location. 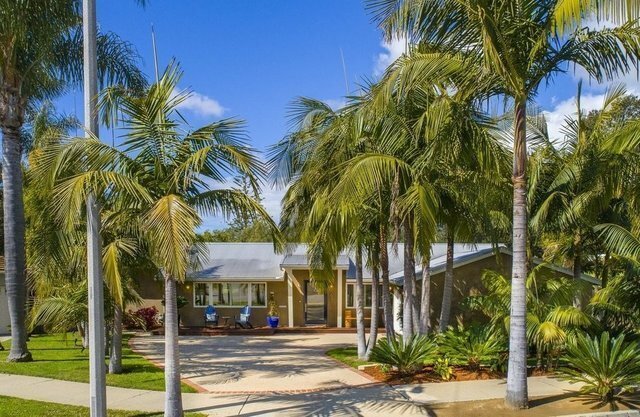 Upon approaching this stunning tropical ranch style home, your eyes will be drawn to an enormous amount of mature palm trees creatively spaced around this beautiful 1 4 acre lot. The front of the home boasts incredible curb appeal with a unique metal roof and unbelievable landscaping.